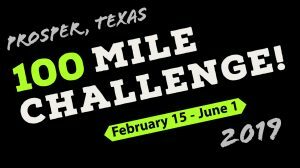 Welcome to the 2019 PROSPER 100 MILE CHALLENGE! The goal is to join fellow Prosper residents and walk, run or bike at least 100 miles in just over 100 days. The Prosper Parks and Recreation Department challenges you to get outside and connect with nature at a Prosper park during the PROSPER 100 MILE CHALLENGE. More than 22 miles of hike and bike trail await! Of course, indoor miles count, too. Feel free to set personal goals that exceed 100 miles and keep tracking those miles! RETURN YOUR COMPLETED TRACKING SHEET LOGGING AT LEAST 100 MILES BY JUNE 6, 2019, TO BE ENTERED IN THE DRAWING. ALL THOSE WHO COMPLETE THE CHALLENGE WILL BE RECOGNIZED AT A TOWN COUNCIL MEETING AND ALSO RECEIVE A COMPLIMENTARY T-SHIRT! Step One: Prosper residents: Join the 100 MILE CHALLENGE by registering here. Step Two: Download the 100 Mile Challenge Tracking Sheet or pick one up at Town Hall (200 S. Main). Step Three: Log at least 100 miles on the Tracking Sheet between February 15 and June 1, 2019. Step Four: Submit the completed Tracking Sheet by June 6, 2019 here or return it to the Town Hall receptionist. We ask that you please register so we know who is participating and also to let us know how/if you prefer to communicate throughout THE CHALLENGE. This program is self-guided, so we want to be able to touch base periodically with news and encouragement! For Challenge updates, follow the Town of Prosper Parks and Recreation Facebook page. Share your adventures on social media using our hashtag, #Prosper100. Questions? Contact Recreation Services Coordinator, Trevor Helton at trevor_helton@prospertx.gov or (972) 569-1064.